At 6:00 am on December 7, 1941, the cook aboard the USS West Virginia, Third Class Messman Doris (Dorie) Miller, was making his rounds collecting laundry. When the general alarm sounded, he ran to his station only to find it decimated by a torpedo, so he ran up on deck. It was there his physical strength and character served him well as he hustled and carried other sailors to safety. Seeing the continuing attack, he stepped into the harness of a 50-caliber Browning anti-aircraft machine gun and fired rounds for 15 minutes until the weapon ran out of ammunition. 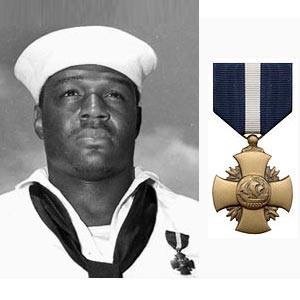 He was subsequently awarded The Navy Cross, the first African American to receive the honor in our nation’s history. His story is still famous in the small Texas town where his sister-in-law, LaRue Miller, a well loved retired educator still lives. Many currently in the community had Mrs. Miller as their 4th grade teacher; they know this story by heart. My mom taught with her for many years, and I had the distinct honor of opening and serving as the first principal of the building and learning community bearing her name, LaRue Miller Elementary School. Mrs. Miller, and her famous brother-in-law, both remain “rock stars” on her campus even today. After a week filled in loving tribute to a heroic American President, let us also be mindful, grateful, and thankful on this day of remembrance for the men and women like Dorie Miller, who selflessly served our beloved country in extreme measures. Like President Bush, Mr. Miller was a critical part of the Greatest Generation. Mr. Miller exemplified the true measure of character during the attack on Pearl Harbor; he faithfully reacted in earnest and resiliency when uncertainty and definite destruction rained chaos that Sunday morning. Sadly, almost two years later, he was killed in action, making the ultimate sacrifice while defending the country he loved and served. How will you choose to keep strong in your own faith as we work to create better tomorrows for all humankind, both here and everywhere? Thank you, Dorie Miller, for doing your part on a day that lives in infamy; thank you, Mrs. LaRue Miller, for continuing to share this important story throughout your life’s work. Let us all keep the message of the season in the forefront of our daily work and lives as we move into the new year. And as always, be a blessing and be blessed, my friends! This entry was posted in Christmas Question, Gratefulness, Personal Reflections. Bookmark the permalink.